When I received Angela Savage’s novel The dying beach out of the blue last year as a review copy, I didn’t put it high in my list of reading priorities. I had – and still have – a pile of books waiting patiently, and I rarely (never say never) read crime novels. However, two things changed my mind. One is that Christos Tsiolkas dedicated Barracuda to Savage, and the other is that this year, for the first time, I will visit Thailand, which is the novel’s setting. So, I read it! Jayne had never imagined she could find love with a man five years her junior, whose background was so different from her own. But Rajiv gave her a whole new way of viewing the world. As if he’d walked into her life and drawn back the curtain, revealing a window she hadn’t even known was there. She was like an appliance without an off switch that kept accelerating under pressure until it threatened to short circuit. The novel opens with a sort of prologue in which Sigrid, who doesn’t play an ongoing role in the novel, finds a body floating in the water at Princess Beach. Sigrid is surprised to discover that it’s the tour guide Pla whom she’d spoken to only that week. She notices some bruises around the neck suggesting Pla “did not die gently”. The novel proper then starts at Chapter 1 with Rajiv and Jayne in bed. It’s here (in the chapter not the bed!) that Savage provides us with the necessary background to their relationship, to where it stands at this point, and implies tensions that may play out in the future – as indeed they do. There is, in other words, a love story to this crime novel. At the end of this chapter they front up to the counter at Barracuda (surely a little homage to Christos Tsiolkas) Tours planning to book a tour with the “exceptional guide” they’d had a couple of days previously – the unlucky Pla, of course. And so the scene is set for their holiday to become another job, albeit unpaid, something that bothers the practical Rajiv but not our justice-seeking heroine. I’m not going to write a lot more about the story, because it’s the sort of book people read for plot and surprises, and I don’t want to give them away. I will say though that it offers lovely insights into Thai character and culture. It is also unashamedly political with its plot revolving around the conflict between economic development and environmental degradation. The title itself refers to the fact that mass shrimp-farming results in the destruction of mangrove forests which in turn causes the beaches to “die”. Truth was Jayne had long felt an outsider among her peers. Since her final year of high school, in fact, when she spent six tantalising months on a student exchange in France. When she returned home, her passion for the outside world met with a lack of interest, if not downright hostility – as though it was disloyal to find anywhere as attractive as Australia. […] For all that Australians like to boast about the national larrikin spirit, in reality only irreverence was tolerated. Unconventionality was not. It’s a little didactic, but ouch! There is, unfortunately, some truth in this. The final point I’d like to make relates to its narrative style. Having read several complex novels recently, that is, books with shifting points of view and intricate chronologies, I rather enjoyed reading something more straightforward. I say this, however, comparatively speaking, because The dying beach does not have a simple, linear chronology. Not only are there a few flashback chapters interspersed strategically through the book, but occasionally the narrative focus shifts from Jayne and her cohort to a couple of characters who appear to be implicated in at least some of the murders. The voice is essentially third person omniscient, though sometimes we seem to shift inside a character’s head. Savage does it well, and I enjoyed the change after the intensity of my recent reads. 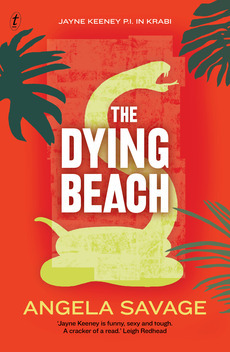 The dying beach is a compelling page-turner that also makes some points about cultural difference and tolerance, the challenge of tourism, and the complexity of environmental management in developing countries. It achieves this without, to the best of my admittedly limited knowledge, deviating dramatically from the conventions of its genre. And that is a good thing, because the result is the sort of novel that could appeal to a cross-over audience. The challenge, though, is how to get readers, like me for example, to cross over. Sounds interesting. Did you like it enough to seek out the other Jayne Keeney novels? I did, in fact, Karen Lee, but I probably won’t because I tend not to go in for series, preferring greater variety. However, for readers who love to find a new series and go for it, I could imagine Jayne Keeney would fill the bill. I shall, thanks to you, go back and start at no. 1. Oh good, MR, it’s great for authors to see that blog reviews have some value for them I think. We can’t really measure it but the more people say they plan to read a book – buy or borrow it – the more the impact can be seen. Sounds interesting and I can’t help wondering about the connection Savage-Tsiolkas! Good question Catherine. 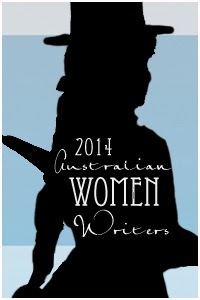 I know Tsiolkas is in a writers’ group with a few women writers, and I half suspect she may be one of the writers. Sounds like a fun read. It is good to diverge from the usual sorts of reading choices now and then. And how awesome that you will be going to Thailand this year! Hopefully the political situation will be calmer when you go. Thanks Stefanie. Agree re the divergence! As for Thailand, yes for our sakes and theirs. Fortunately we are not going near Bangkok. It’s another divergence thing … We are doing something we never do and are going to a resort! It’s an extended family celebration event just for 4 nights. Our irreverence is certainly a start, Hannah, but these days it doesn’t seem to be backed up by analytical thought, does it!